We have two types of photography sessions. The first is traditional and allows you to have professional prints chosen and printed with the best printers available, on high end paper and using the best ink. The second, allows you to purchase a photography session and all the edited photographs on a high resolution CD. Images will be printable 8x12 and under. Larger sizes 11x14-30x40, may be purchased from us. $50.00 Up to one hour, two changes -children or Senior sessions- outdoors in Anderson County, studio or at your home. $ 85.00 Studio Bridal Portrait Session or Professional Headshots at our location. $125.00 Large or multiple families on location Anderson. Office Teams or Groups at our studio location. 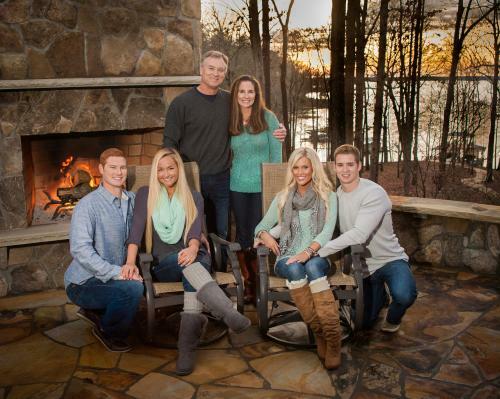 $150.00 Hartwell Lake Sessions, Clemson, Greenville and Bridals on location. MINI SHOOT AND BURN $200.00 30 Minute session for a small family or children. One location in Anderson County. Includes session fee and 4 photos for 8x12 and under printing. Retouching by request at $60 an hour or $15 per head. Full amount due at session. SHOOT AND BURN $350.00 60 Minute session in Anderson County for a larger family or more deluxe shoot that requires more time and photos. Includes 6-8 images printable to 8x12 and under. Retouching by request at $60 an hour or $15 per head. Full amount due at session. DELUXE SHOOT AND BURN: $650.00 Good for engagement sessions, Bridal sessions, infants, children, lifestyle sessions. Break downs of family member poses or changes of clothing, One Location of your choice in Anderson County. 1-1.5 hours and the CD of ALL the edited photos, is yours for 8x12 and under, printing! Images included ﬂuctuates, depending on the session and response of the subject(s) to the camera. Add $85.00 for 30 extra minutes or $175 for each hour over and above 1.5 hours. Full amount due at session. CLASSIC CANVAS OR GALLERY WRAPS (No glass needed) Retouching included. When you want THE BEST! ACID FREE MOUNT (no glass needed but it can be an option) Retouching Included! 20X20 7 OPENING DIGITAL MAT AND FRAME $475.00 Great for Family Portraits, Children or when you don't have a lot of wall space. Find Value in a combination of a wall portrait and package prints! Additional poses may be added a discount price of $35 per sheet. All sheets are retouched. -20X20 Digital Mat with Frame using nine of your favorite images. 6 SESSIONS: Newborn, 6 WEEKS, 3 MONTHS, 6 MONTHS, 9 MONTHS, ONE YEAR! Includes 20x20 Digital Mat with Frame, 9 images from the 6 growth sessions. 1 8x10, 2 5x7s and 8 wallet print package from each session.